This past year has been a whirlwind of ups-and-downs, strange and awkward encounters, love, soul-searching and an overflow of emotions I’ve never felt before. I’m going to try to tackle something I’ve thought a lot about during my first year here, but have a hard time putting into words: I’m the happiest I’ve ever been in my life. That’s not to say I wasn’t happy in the States; I was extremely happy there. I was still doing work I loved and around people every day who pushed me, cared about me and were just all around inspiring people. But this is a kind of happiness I’ve never experienced before. It’s something I’ve found only people who have spent a sufficient time abroad in a developing area understand. I’ll call this newfound emotion: “pure ebullience with a hint of peace and simplicity”. I’ve heard that you will never feel more alive in life than you do in the Peace Corps, except when you have you have your first child or get married. I believe it. I feel damn alive. I do absolutely nothing on weekends. My best friends in the village are 10-year-olds. I’m addicted to Generations, a South African soap opera and can’t survive a day without it. I’m in bed by 9 p.m. every night. I usually can’t understand most of anything that’s being said around me; I have to force myself to not laugh. I now consider killing bugs an art. I can spend a day sitting on my stoop and watching the rooster in my yard, proving that it’s the dumbest animal on the planet. My life on paper sounds so, so, so dull. Yet every day, I ironically feel awake. I feel like my heart is vivaciously pumping joy through my body. You know when you’re depressed and your heart feels like it’s just sinking in your body? My heart is the opposite – it always feels somewhat uplifted. Even if I’ve had a stressful day, the sheer reminder that I’m in a different culture and country from my own fascinates me. I pick my brain, analyze and contemplate. I could be sitting in the back seat of a crammed 14 person taxi between three gogos, sweating with four grocery bags on my legs and still be content by just staring at the window at all the rural huts. I’m always absorbing my surroundings. I look at all the people around me and think about the stories, the struggles and the lives these people live. I could sit in the village for a week straight and just watch the way of life. I’m cherishing this opportunity to finally experience how other people in the world live. The Peace Corps has complemented my curious nature and journalism background and will never get old. People are SO INTERESTING. My school’s staff has taken me in as part of the family; I can tell they genuinely have my back and care about me. My host mom welcomed me as one of her own. The Mathebula family considers me to be part of the family – I finally have siblings! This is a huge deal coming from an only child. I know love is seeping through my straw roof and Pepto-Bismol-pink colored walls every day (and a pleasant surplus of new spider friends). 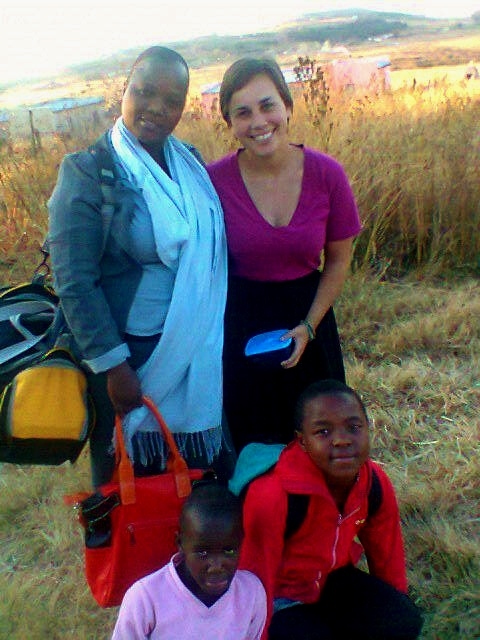 My learner Ayanda invited me over for lunch wither her Aunties (Aunt Grace on the left; Ayanda in the red). I was welcomed with open arms! And most importantly, I have a sense of purpose. I know that by being here, especially after this country’s history, is changing perceptions. I am a white lady living in a black village, something that would never be seen in South Africa if it weren’t for the Peace Corps. I am showing the people I live amongst that we all share a common humanity, no matter where we come from. My principal once stood up at a Peace Corps workshop – way, way back in the beginning — and mentioned that in the Apartheid era she was scared of whites. She then went on to say that every time Siyabonga (Will, my closest Volunteer) comes to my school to visit me, the learners see not one, but two white people that care for them, interact and play with them. We expose rural youth to some diversity that they rarely experience. I was so proud of her to stay such a profound thing in front of dozens of Americans and South Africans. I know why I am needed here, so this ebullience never goes away. South Africans always ask me, “Mpho, aren’t you bored? Don’t you miss home?” and I honestly tell them no. You don’t need a lot to be happy. You just need the right people with a hint of peace and simplicity: umuntu ngumuntu ngabantu — a person is a person through people. My African name is Mpho, which is Sotho for “a gift”. But I don’t think I’m the gift. I consider this whole experience a gift. In a year, I’ll have to face the hardest part of my Peace Corps service – saying goodbye. One year seems like a long time, but it really isn’t because this year has flown by. I have no idea what the next year entails, let alone next week. I do know that I will continue to stay this happy and will continue to learn more about myself and our common humanity than I ever thought was imaginable. I’ll be sure to make this year count because it’s a time in my life I’ll never get back. Congrats to my fellow SA 26s who reached the one-year mark. Ya’ll deserve a pat on the back! I am completing my Peace Corps application tonight. Thank you so much for this post, even though I found it randomly, the fact is that I found it and I’m inspired. Thanks for reading – glad you found it inspiring. Best of luck with your application!